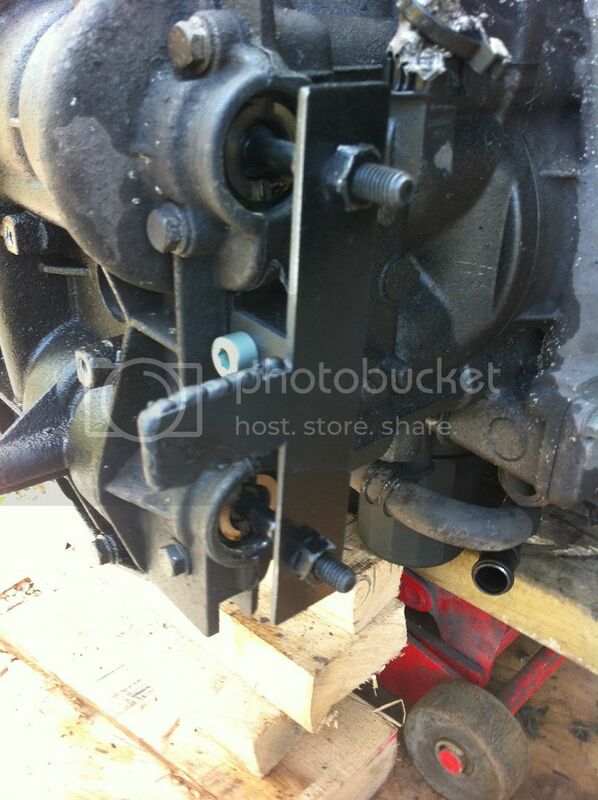 Am planning on dropping the gearbox, as I have a leak between the engine and gearbox, thats got progressively worse. its either the RMS or IMS seal leaking - will find out soon enough! I have read threads where people have used 8mm drill bits and then bought the bolt-on locking tool separately - however cant see anywhere that sells the bolt-n bit on its own. I know Alex used to make them, but don't think he does anymore. This looks the cheapest option to get the bolt-on tool? Also - are there any 'how-to' guides on actually checking the bearing for play? You can just make one out of some flat plate, I used alloy check my thread linked below. They are different for 3 and 5 chain engines so make the right one! Bearing you are looking for radial and axial play. Does it feel smooth? Too loose? Too tight? Is it clean in there--will be full of black oil but should be nothing else. 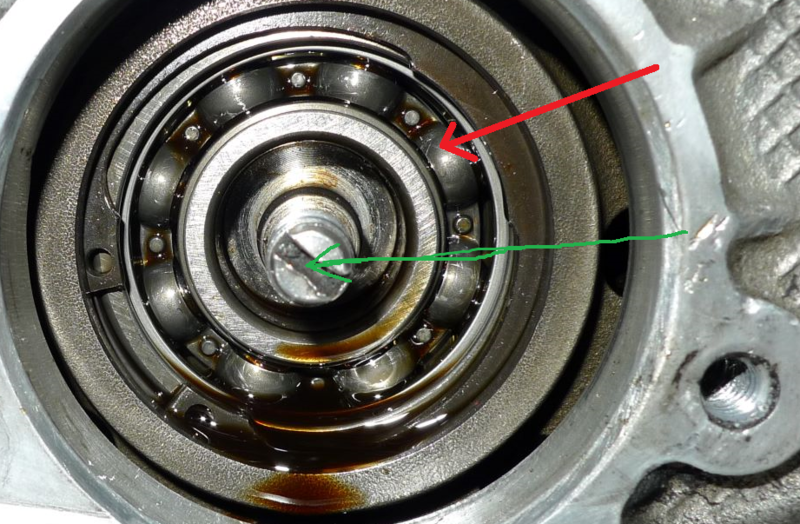 Stop the bearing cage with something - will it still spin? Didn't think you needed to lock cams for doing this job. Just lock the crank and slacken bank 1 chain tensioner off. To check the bearing, as Wasz says, hold the cage in a static position and try and spin the centre spindle. If you can it's worn. I just done this job, instead of doing IMS leak I end up with engine out, my tool was made from 3mm aluminium bar I will take picture tomorrow for you, you can buy on ebay bar for £4.29 if you are handy with tools about 1h to do it. Thanks - as always this forum comes up trumps! Sounds like I dont need the tool at all (just an 8mm drill) - thanks for the link to the thread Alex! Wasz - thanks for the bearing check advice - am comfortable following that. Szymon - useful picture - shows what Wasz was suggesting. Also thanks for the advice about other bits to consider. I may end up taking the engine out, as I have some oil leaking around my AOS. Depends if you take a brave pill first. There is a risk of movement.... Small and I understand lots of people don't bother. It would have been very awkward for me if it did move so I locked it up. Once you start locking cams, you've to then replace cam end caps as removing your old ones makes them not fit for use. So long as the chains are slack and the engine's locked I can't see anything going wrong, so long as you're not trying to extract the bearing or press a replacement in. Thanks - I have just ordered 2 caps (£10 incl postage!) - having read the thread, I should only need to remove two of the caps. Realise it may not be entirely necessary, but would rather go belt and braces. Was just surfing round the forum(http://www.911uk.com/viewtopic.php?t=102469) and found this tool that Harv had made. Being lazy, think it will be easier for me to make a tool with my mig that is similar to this (wont be exactly the same), rather than trying to cut 3 lots of 2mm plate to create an exact replica of the Porsche tool. I've just ordered some guage plate yesterday so I can do a run of the 3.6 tools when I get chance but it may be a few weeks off. Thats great Alex - that will save me knocking one up....I think there were quite a few people who were wanting one! Yeah, I noticed that, hence me ordering some material. Just doing a run of some now. But as Alex is making some more of the locking tool, will go with that.....as I have enough jobs to do without having to make the tools to do the jobs. That brake pipe is fitted first at the factory. To fit the steel pipe you'd have to drop loads of pipes and brackets to get it in (see mistercorn's thread, he did this), or unbend/rebend it a few times risking work hardening the pipe and damaging the coating. Kunifer can be threaded in and bent as you go. I did the lot in kunifer, I can't think of any valid reason to complicate the job by using steel. If you don't like the look of kunifer then thread it through some black heatshrink tubing before fitting, then shrink to fit once done - this will look factory. All the other brake pipes are easy to do, apart from the one that runs in front of the steering rack.